If You Eat Food, Read This Book! This is a very informative and well written book about Genetically Modified Organism, also known as GMO’s. GMO’s were pretty much sneaked into our food supply in the almost thirty years ago. These plants either make their own pesticides (they are pesticides and we eat them) or they are resistant to pesticides, like Round-up – which can be poured all over them and they won’t die. GMO’s take away our seed sovereignty and our farmers, who for generations saved their seed, have to buy new ones every year when they use this technology. There have been no human safety studies for any of these foods and there is growing evidence that they are causing a host of new illnesses like severe allergies and immune issues. The author, starts out by telling her personal story of how she had a debilitating illness and how her very young son had terrible eczema. After seeing many doctors, having all the tests and still not finding any relief she went to a very prestigious allergist who diagnosed a chronic allergic response to GMO corn. She took herself and her family off all GMO corn (corn, corn syrup, citric acid, baking soda, vitamins – corn is in SO much of our food) and over time of eating real food, cooked from scratch and avoiding GMOs, both the author and her son healed. 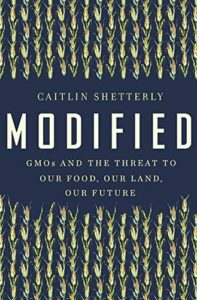 This book has a lot of great information but it’s written as a story of the author health and her travels to visit farmers, scientist, activists and more to learn about GMOs. This is a brilliant book with information that’s so important. A must read and highly recommended.